Facebook may be for social connections between families and friends, but its Messenger platform is home to over 300,000 customer service, marketing, and sales chatbots – and this number isn’t slowing down anytime soon. How does one even operate? A chatbot is a piece of software that is either pre-programmed or powered by AI to hold conversations with human users. These interactions are often text-based, but through conversational interfaces, they can occur vocally as well. What does this mean for Facebook marketing and business strategies moving forward? David Marcus, VP of Messaging Products at Facebook, announced the sharp rise of Messenger chatbots during a keynote presentation at F8 2018. He also stated more than 8 billion messages have been exchanged between Facebook users and businesses that are utilizing chatbots. With a 73 percent satisfaction rate, live chat software has emerged as the top way for customers to interact with businesses. Automation isn’t going anywhere. Up to 85 percent of all customer-business interactions will take place without a human intermediary by 2020. In an experiment by HubSpot, content delivered through Facebook Messenger had an open rate of 80 percent and a click rate of 13 percent. The same content delivered through email had an open rate of 33 percent and a click rate of 2.1 percent. In other words, email was completely outclassed by Messenger. While 300,000 chatbots sound like a lot, it actually equates to less than 1 percent of businesses on Facebook taking advantage of the technology. If the numbers above indicate anything, it’s that more businesses should look toward Messenger and its chatbot capabilities to bolster their social media marketing strategies and stay competitive in the near future. That’s why we’ve compiled a full guide on why you should consider getting your Facebook chatbot up-and-running. Does anyone here remember when Cleverbot launched in 1997? I may have been young at the time, but I remember spending hours asking Cleverbot pointless questions and getting less-than-optimal answers. These interactions, however, weren’t for nothing. 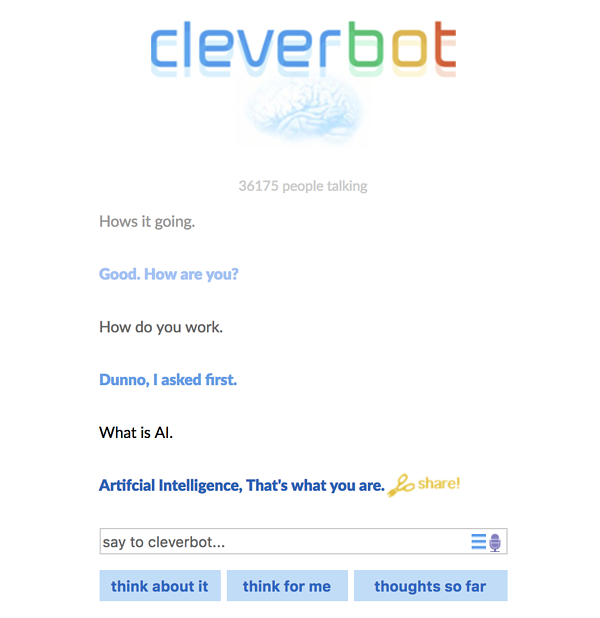 Because Cleverbot is powered by artificial intelligence (AI) and not pre-programmed, it is constantly learning how humans interact and the ways we frame our questions. Since 1997, Cleverbot has learned from nearly 300 million interactions with humans. Little did we know that going down the endless Cleverbot rabbit hole would help pave the way for future chatbots – ones that would be much more valuable to businesses. We may not be fully aware of it, but many of us hold conversations with chatbots just about every week. Some of today’s most widely-used chatbots include Amazon’s Alexa, Google’s Assistant, and Apple’s Siri. I’m guessing a few of these sound familiar. The use of digital assistants is on the rise and more people are taking to chatbots as a first point-of-contact with businesses. While chatbots have traditionally supported customer service departments, more businesses are now using them to automate marketing and sales efforts. For a simple entry point into the chatbot world, look no further than Facebook Messenger. Amongst all mobile chat apps, Facebook Messenger ranks second with about 1.3 billion monthly active users worldwide. Facebook, however, still remains as the most popular social media network, with 79 percent of U.S. adults obtaining a profile, making Facebook marketing a goldmine for social media marketing teams. This means if you have a Facebook business page (you should really create one if you haven’t already), there’s a good chance a user will engage with your chatbot to learn more about your business. Facebook chatbots are live at all hours of the day and send near-instant responses to user inquiries. Even if a chatbots sole purpose is to answer FAQs, it still frees up valuable time for your customer service staff. Since Facebook actually grades businesses on how responsive they are to messages, users will feel confident that their questions will be answered in a timely manner. Besides, you don’t want a potential customer lingering, do you? On the note of potential customers, Facebook chatbots are great for engaging with those who have discovered you via Facebook and are ready to purchase something from your e-commerce business. 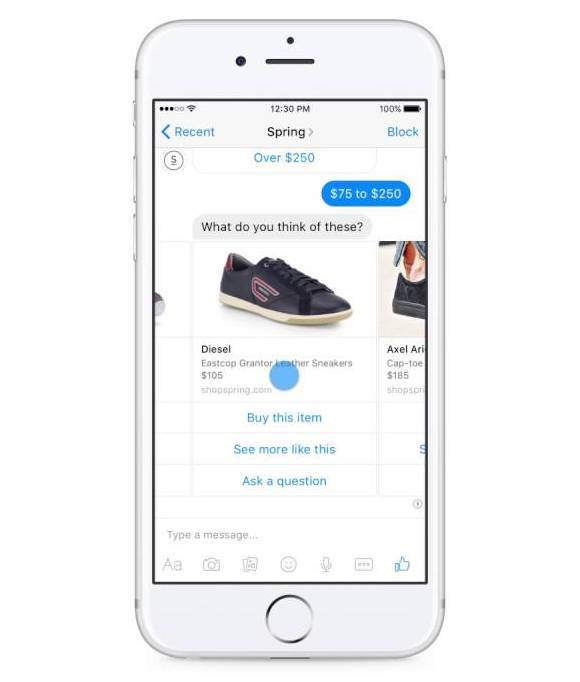 With e-commerce software capabilities, your Facebook chatbot can identify which item the customer is looking for and connect them to that item via social media call-to-action (CTA) buttons in a matter of seconds. A recent study by DigitasLBi revealed that 37 percent of U.S. adults are willing to make a purchase via chatbots – with the average purchase totaling $55. Clear CTAs and a seamless checkout cart will boost customer confidence when making a purchase. Leads are an important part of any marketing strategy, especially when it comes to B2B marketing. Any of your current followers or users who have engaged with your business page at some point are now part of your subscriber list on Facebook. What does this mean for your business? 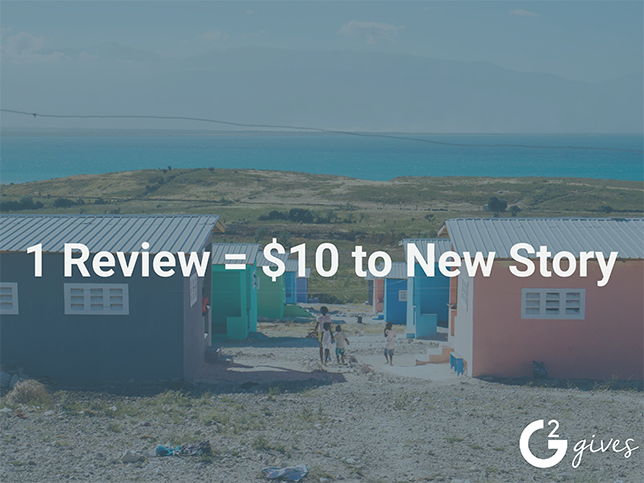 Well, both current customers and customers in your scope can be targeted via Messenger for relevant offers, coupon codes, blog content, and more. Facebook chatbots are the deliverers of these messages. Since customers are much more likely to open a Facebook message compared to email, you can expect higher engagement rates. One of the advantages of utilizing a Facebook chatbot is its ability to retain tons of data from customer conversations. When this data is put into action, it can lead to more targeted social media and omnichannel marketing strategies. Facebook Analytics is a good starting point for visualizing the activity of your Messenger bot. You can see how many total users are engaging with the bot, the demographics of these users, and the retention rate. There are other analytic tools, however, that provide more in-depth insight to your chatbots’ performance. Some of these tools unveil who the most engaged users are what drives them to continually use your chatbot. Other tools show which messages have the highest conversion rates. People are more open to using chatbots now than ever – and this isn’t just because of the added efficiency. Some of the top-performing Facebook chatbots today provide a personalized, branded experience to its users. For some inspiration on how to provide a similar experience, we’ve listed some of these chatbots below. Jeff Jenkins, Whole Foods’ Global Executive of Digital Strategy and Marketing, stated that were are living in the “expectation economy,” and that consumers would like to be equipped with relevant content by brands they follow. This sentiment served as the basis of Whole Foods’ Facebook chatbot, which launched in 2016. The main purpose of this chatbot is to connect Whole Foods followers with unique recipes. The chatbot takes in a variety of information about the user, such as dietary restrictions and protein preferences. After a recipe is selected, the user can either go with it or opt out for a new one. 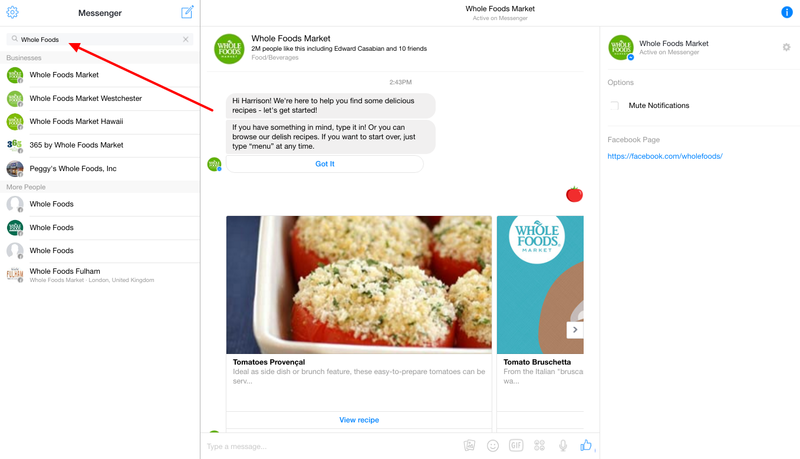 Some other neat features of the Whole Foods’ chatbot include processing emojis, linking up to customer rewards, saving recipes for later, and allowing users to signup and receive coupons. 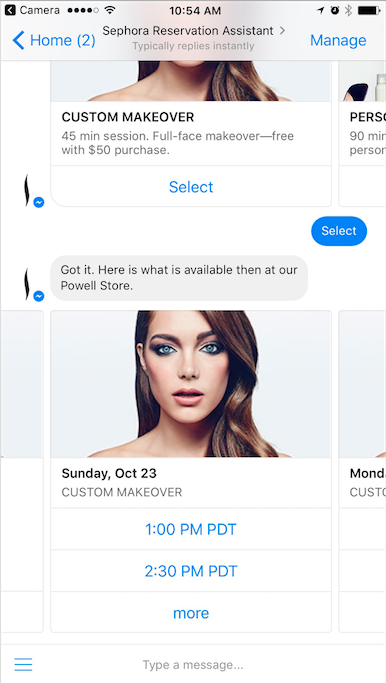 One of the top cosmetic brands in the world found a new way to serve customers and increase engagement through its easy-to-use Facebook chatbot. Labeled the Sephora Assistant, this chatbot gained in popularity after Sephora ran a targeted Facebook campaign for U.S. women ages 18-49. When the ad was clicked, the bot would open in Messenger and guide users through a three-step scheduling feature. The results? An 11 percent higher booking rate of in-store makeup appointments. By utilizing a user’s GPS location to connect them with the nearest store, the booking sequence was also reduced by five steps. Now the chatbot is considered one of Facebook’s top performers. Having to hop on Google to find the latest, most relevant news to your liking can be time-consuming. 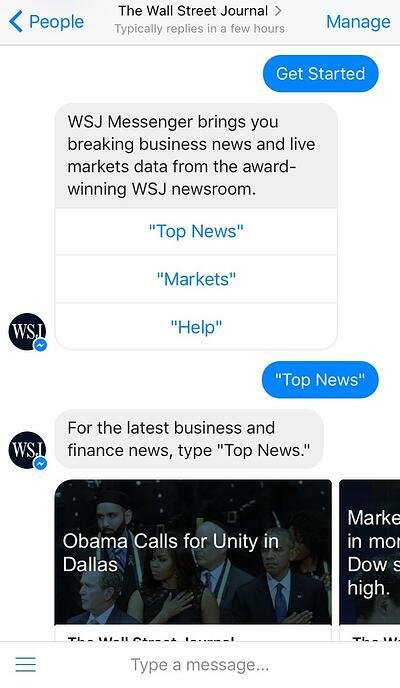 The Wall Street Journal decided a Facebook chatbot that curated news for its users would be the best way to counter this issue. Through clear CTAs, users can customize which content is fed to them through the chatbot. The longer the user engages with the chatbot, the more tailored their newsfeed will be. This is the power of AI. Let’s face it, our smartphones are full of applications that rarely get used on a regular basis. If you’re adverse to downloading yet another app just to order a pizza, you can jump on Facebook Messenger and place your next order through Pizza Hut’s chatbot. In similar fashion to Sephora’s chatbot, Pizza Hut has reduced the amount of steps needed to finalize an order. Fewer steps equal faster delivery, which also equals more time to consume however much pizza your heart desires. 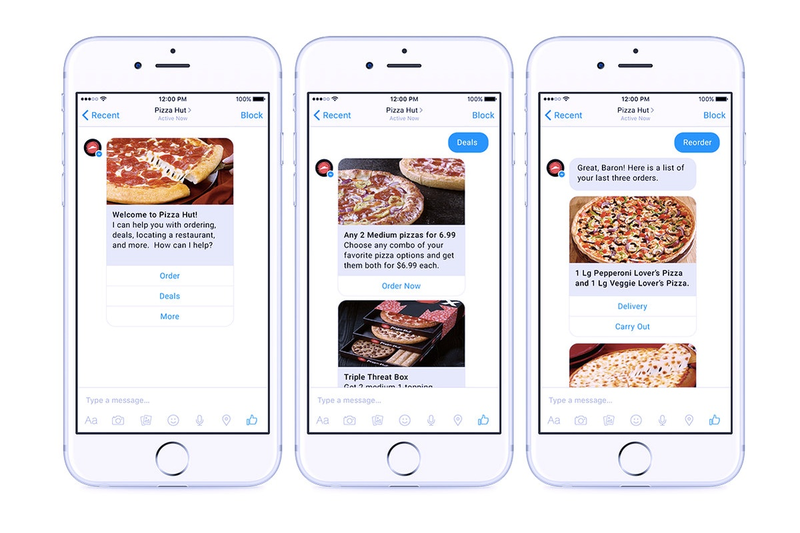 Pizza Hut’s chatbot collects transaction data for an even faster checkout experience your next time through. It also uses this data to suggest new items or promotions – providing franchisees with up-sell opportunities. 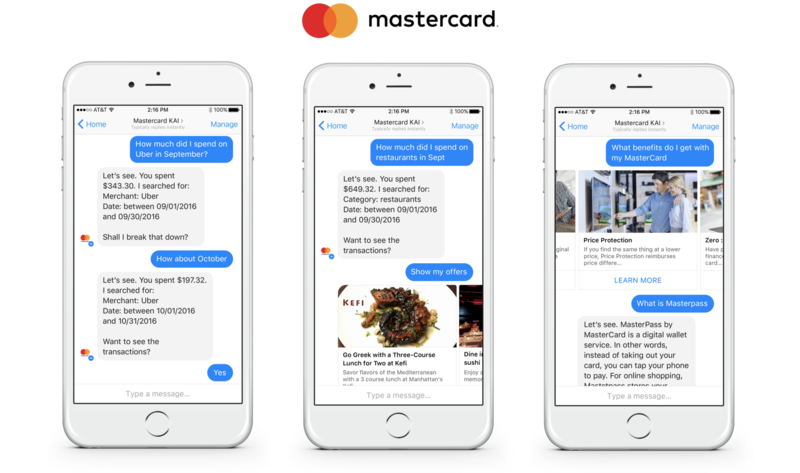 Mastercard, one of the leading financial service providers, recognized the widespread adoption of chatbots and decided to implement its own on Facebook Messenger for both banks and merchants. By utilizing natural language processing software, which dissects human language in a more sensible way for machines, the Mastercard chatbot has a robust set of features. For merchants, Mastercard has enabled customers with the Masterpass payment service to conduct transactions through the chatbot. This is great news for merchants that haven’t built their own chatbots but would like the added efficiency of one. Mastercard has also empowered customers to communicate with their banks via the chatbot. For example, users can check their bank accounts, purchase history, and even ask the chatbot to monitor spending habits. This is a great example of a chatbot that provides value to both users and businesses. There is, of course, the looming question of “how much is this going to cost me?” Fortunately, Facebook chatbots are actually free to build and implement, however, it does require some technical skills. Depending on the complexity of your chatbot and the type of conversations its expected to have, you may need to seek external help developing it. 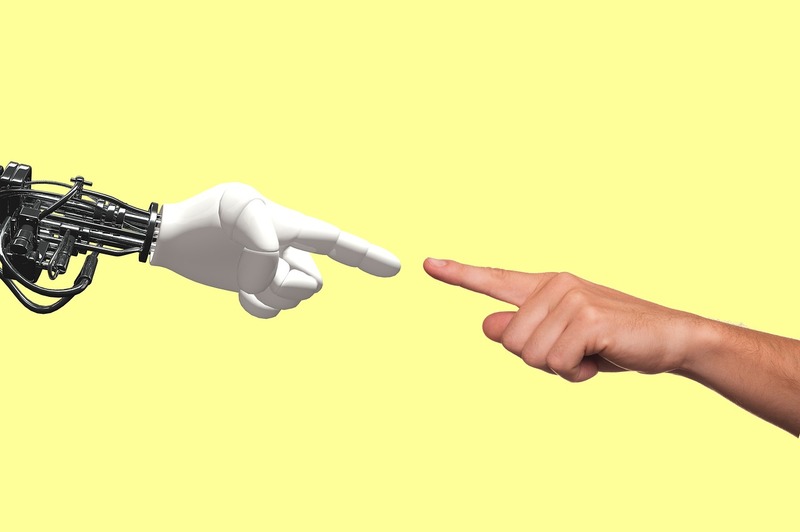 For example, a chatbot with pre-programmed responses could be developed quickly, while a chatbot that utilizes natural language processing may take longer. For a more in-depth explanation on how to build your Facebook chatbot, check out Facebook’s quick start guide for developers. Whether you’re just releasing your Facebook chatbot, or figuring out ways a chatbot will be valuable to your business, here are four universal best practices for getting the most out of this technology. As mentioned before, chatbots collect a variety of data on each user that engages with one. In the age of GDPR and with so much concern around personal data protection, it’s worth being upfront with your customers. While it's difficult to give users complete control over which data they share, you could provide a few ways for them to opt in or opt out. The example above prompts the user to check out a privacy agreement and asks for permission before storing the user’s name and Facebook ID. This is true for the most part, but like humans, chatbots are prone to making mistakes. Sometimes a chatbot has difficulty understanding the user’s intent. The question may not be clear, or there could be a typo that limits the chatbots ability to answer correctly. Other times, a chatbot can drop the ball completely – and this could end up annoying the user more often than not. Unfortunately, 73 percent of U.S. adults said they would ditch a chatbot after one bad experience. A Mindshare report resonated this claim, stating that 61 percent of people find faulty chatbots more annoying than human representatives. This is why it is key to have employees with strong customer service skills on-hand. Customers using your Facebook chatbot could face unexpected issues. This is why you should be proactive about inviting feedback from users. This is especially true for newly-implemented chatbots. Missteps are inevitable, but that doesn’t mean you should be complacent when they occur. Part of learning is running into mistakes, testing new solutions, and measuring those solutions. 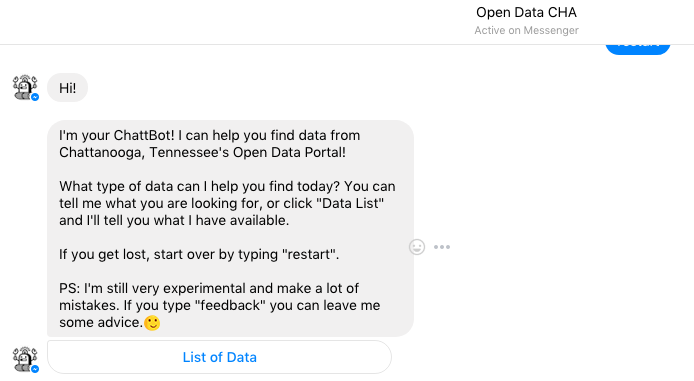 Run net promoter score feedback surveys to help better your messenger bot. Facebook chatbots aren’t here to entertain users. Their objectives are to save time, increase brand awareness, and serve as an additional arm to your marketing, sales, and customer service departments. While personalization is great for a chatbot, keeping answers as clear and concise as possible is sure to retain users. The image above is a great example of how CNN’s chatbot condensed an article that is thousands-of-words long in just a few sentences. Facebook chatbots – or any chatbot for that matter – aren’t perfect by any means. However, the ways they automate even small business processes demonstrates why chatbot technology is on the rise. As a matter of fact, chatbot conversations are on track to save businesses nearly $8 billion in productivity by 2022. A reported 80 percent of businesses see AI (which powers chatbots) as crucial for reducing operational costs. Although, many of these businesses haven’t devised a plan to use this technology or feel they have the expertise to do so. Facebook Messenger, however, has emerged as one of the simpler platforms to apply AI technology. With only 300,000 Facebook chatbots currently live, now is a great time to enhance your Facebook marketing strategy with a chatbot. For more information about chatbots, or to see which chatbot solution is right for you, check out of the top-rated chatbot software in 2018.